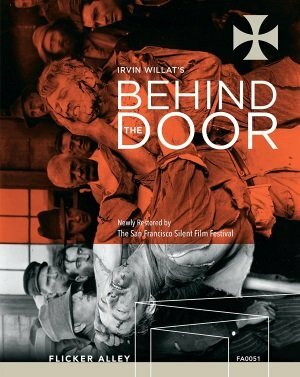 Behind the Door (1919) (Flicker Alley, Blu-ray+DVD) was for decades a film known by reputation only. A good film, yes, but more than that a notorious one, for what lay behind the door was… No spoilers because the film, once known to exist only in incomplete form, has been reconstructed and restored by the San Francisco Silent Film Festival and released on disc by Flicker Alley. Its reputation proves well-earned. Hobart Bosworth plays Captain Oscar Krug, an American seaman of German ancestry who left the sea for life ashore for the love of a woman. But in the opening moments of the film he’s a haunted man returning to the ghosts of the past in his old taxidermy shop, now a ransacked ruin choked by dust and shadow. His story plays out in the shadow of this resignation, a sunnier time when he was in love with banker’s daughter Alice (Jane Novak) and respected by his New England community. A jealous suitor uses the outbreak of World War I to whip up anti-German hysteria (which, in 1919, was not that distant a memory) but the two-fisted patriot wins over the mob with a roundhouse of a brawl and a rousing proclamation to do his duty, as every American should. He bonds with his opponent, McTavish (James Gordon), over the brawl and a few cuts later Krug is captaining an American naval ship, the Perth, with McTavish as his loyal mate and friend. And Alice stows aboard, kicked out by her possibly-crooked, definitely-shady banker father, ready to do her duty as a nurse. Then the unmistakable conning tower of a submarine rises from the surface of the sea and German U-boat commander Brandt (Wallace Beery) torpedoes and sinks the Perth with far too much malicious glee. If director Irvin Willat makes a point of celebrating the patriotism of German-Americans, he brands the German enemy with the familiar stereotype of the bloodthirsty Hun. The rest of the story is best discovered on your own because it’s a doozy of a portrait of war crimes and gruesome revenge. G.W. Pabst’s The Joyless Street (1925), the Centerpiece screening on Saturday night, is a landmark drama of social commentary, a savage portrait of Germany after World War II, when rampant inflation and record unemployment plunged an entire class into poverty and widened the gulf between rich and poor into a veritable ocean. Decadence and desperation and degradation: this has it all, and with a drumbeat of social drama drawn in stark images and situations. Greta Garbo takes her first role since being “discovered” in Gosta Berling’s Saga (1924) and is marvelous as the devoted daughter of a widower civil servant, basically taking care of her father and her little sister while he gambles their entire future on a stock market bet (a rigged game that we know is doomed to ruin them). Endlessly nurturing and sacrificing herself for others, we know where she’s headed when she ends up in hock to Frau Greifer (Valeska Gert), the neighborhood clothier with the secret club in the back and the procurer who turns desperate women into hookers for her male clients. Garbo is elegant and dignified without tipping into the Hollywood glamour that would soon define her (and fix her teeth), the honest working class innocent about to be savaged by the economic piranhas circling the stream. The ostensible lead, however, is Asta Nielsen, the thirtysomething German superstar playing the teenage daughter of an impoverished and pious war veteran who accuses her of prostitution and essentially pushes her to it out of necessity. Dressed to the hilt by a smitten banker in fashions that make the Ziegfeld Follies look restrained, she goes through the movie like the walking dead, numb with shock at her station, which apparently her foreign fat cat client finds alluring, if confusing. Werner Krauss plays the butcher, who hordes his products to trade for sexual favors and wields the power of his position like a petty tyrant, and there’s an American aid worker, an aspiring young banker trying to follow in his market-manipulating boss’s footsteps, and a decadent young woman ready to trade her affections for the richest beau, plus there’s a couple of murders, a fiery suicide, a healthy dose of madness, and lots of lurid spectacle. And yet watching the film is tough. Manny Farber’s designation of “elephant art” came to mind while working through the screening. This is long (over 2 ½ hours), important, heavy, full of social commentary and dreary lessons, and it goes on and on, teasing us with the threat of degradation of its struggling characters while showing damaging actions of the rich. It’s also overloaded with storylines, top-heavy with major characters (some of whom suddenly disappear for long periods, perhaps due to missing footage), confusing and complicated and at times clumsy in its storytelling.